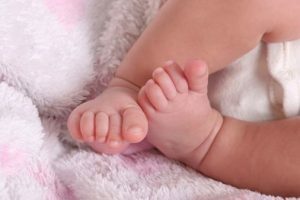 A baby’s feet are beautiful. They’re tiny, pink, clean and kissable. So as parents, it’s up to you to protect the two tiny feet they are born with because it’s the only two they’ll ever have. Babies come into the world without shoes and flat footed. There’s nothing wrong with a baby going barefoot or stocking footed up to first year or so. Once they are ready to walk you can put shoes on their feet. However, if you notice a problem with the feet of a young child, visit Dr. Brook or Dr. Northcutt immediately. A problem that exists early on will not correct itself. Inspect children’s feet often. They are soft, flexible and are susceptible to pressure that can lead to abnormal walking trends, making it difficult to participate in normal physical and social activities. Your child should be examined by a podiatrist no later than the time he or she starts school. Always look critically at the way your child moves. Limping and other tell-tale gait abnormalities may indicate problems that can be corrected if dealt with early. If your child is in pain, don’t ignore it. Pain is often the body’s way of letting you know something is not right. Teach good hygiene and nail grooming to children who are old enough. Until that time parents must educate themselves on correct nail grooming and pick up the clippers, or get assistance from your podiatrist. Shoe shopping presents another challenge that parents must face head on. A growing child will probably require more than one pair of shoes per year. If you are trying to keep a child in street shoes and sneakers, this can become a financial challenge, multiplied by the number of children in your household. Your child needs to be fit in a shoe that is roomy in the toe box, supportive in the heel, fastens snugly to the foot to prevent forward sliding and have a flexible sole where the foot flexes. Leather and canvas work the best for kids because kids are active. These materials are durable and allow for circulation. While guarding children’s feet in the summer months, remember, shoes are the best protection against injury, but often, quick as a wink, the shoes come off. If any mishap occurs remember Drs. Brook and Northcutt are here to treat wounds, athlete’s foot and fungal infections, as well as, all other ailments of the foot and ankle. They treat all ages of patients from babies on up. Call Dallas Podiatry Works at (972) 566-7474 or Baylor/Plano at (972) 943-3323.